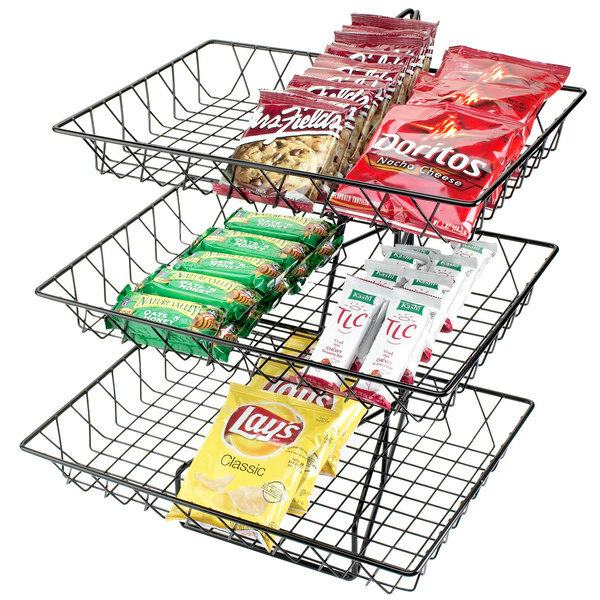 Cal-Mil 1291-3 Three Tier Merchandiser with Rectangular Wire Baskets - 18" x 22" x 20"
Cal-Mil 1291TRAY Black Wire Tray - 18" x 12" x 3"
Add a level of dimension to your traditional breakfast buffet, hotel, cafe, or cafeteria displays with this versatile Cal-Mil 1291-3 three tier wire basket rack. It's perfect for merchandising both fresh baked goods and pre-packaged snacks and includes three 12" x 18" black powder-coated wire baskets. This attractive display and merchandising riser utilizes vertical storage to save countertop space and add height to your presentation, while the classic black frame is sure to match any decor. Overall User Rating: Cal-Mil 1291-3 Three Tier Merchandiser with Rectangular Wire Baskets - 18" x 22" x 20"
Love this stand. Used it in a coffee bar for dry pastry products. Good quality and build well. Only problem is that you need to evenly distribute products as the shelves may slant and fall off if there is too much weight on either side.